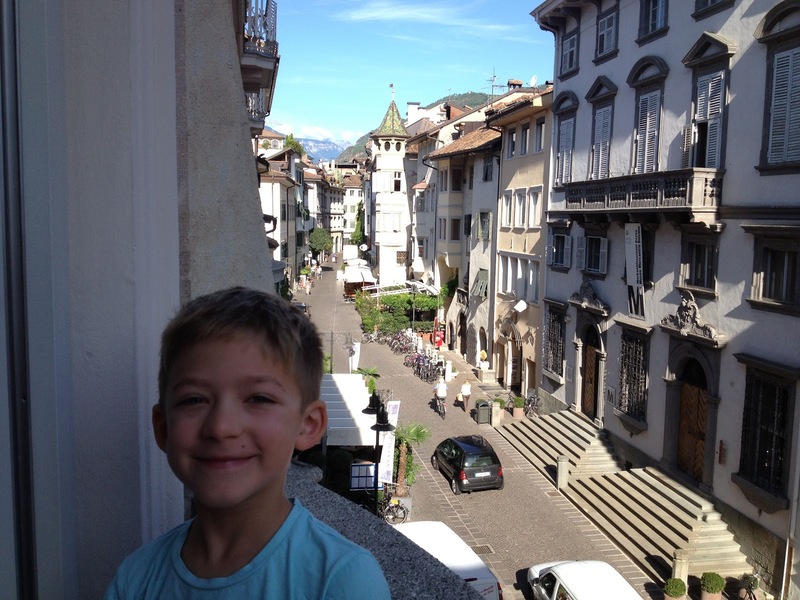 Tucked into the mountains of the South Tyrol region just over the Austrian border and in the northern most point of Italy, Bolzano (as it's known in Italian, Bozen in German) is a little gem of a bilingual city. German is the dominant language in this Italian town, so you'll see pretzels and strudel on the menu alongside pasta and gelato. We used Bolzano as a stop on our way from Munich to Venice and it's high on my list of cities to return to. It's also high on the list for many Italians, as Bolzano regularly shows up on a list of top cities Italians would like to live in, via a yearly reader survey in the newspaper Il Sole 24 Ore.
Our main focus in the 24 hours we had in Bolzano was visiting the South Tyrol Museum of Archaeology and the world famous 5,000 year old Ötzi the iceman. Parks, castles, cable cars, and a zoo could have kept us occupied for another few days. The covered arcaded shopping areas (think luxury shops, not tacky tourist "arcades") would be a lovely way to pass an afternoon while you send the rest of your family off to a reconstructed Copper Age (3,500BC) village in the ArcheoParc a short drive away. I emailed several hotels listed in my DK Family Guide to Italy to see what family accommodations were available. The historic Stadt Hotel Citta (Stadt is city in German, Citta is city in Italian) was the winner and we loved their idea of a family room. Two bedrooms, one with triple twin beds, a good sized bathroom, a small balcony, and an entryway made it feel like a small apartment. Breakfast in the morning was an amazing assortment of charcuterie, cheeses, yogurts, granolas, fruits, and breads and cakes from their in house bakery. 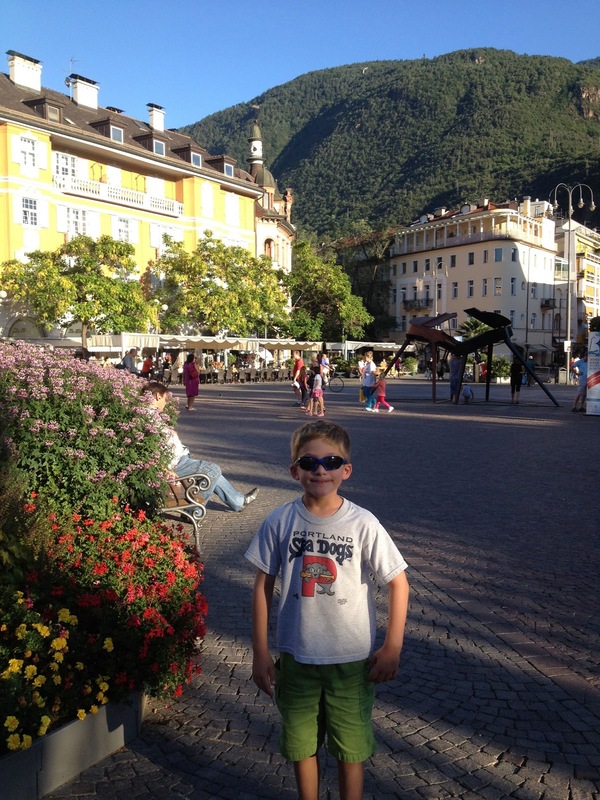 The hotel sits on the corner of a beautiful town square, Piazza Walther/Waltherplatz. Trendy shops and restaurants line the bustling square and there's lots of activity to keep the kiddos occupied. Families stroll through with their kiddos on bikes or kicking a soccer ball, there are statues and benches for climbing, and it's a great place to let them run around. While you sit at a café table with a glass of gewürztraminer, of course. We ventured beyond Piazza Walther for dinner, making an adventure out of exploring the narrow and twisty streets around town. Both of my guidebooks recommended the popular pub Hopfen & Company just a short walk away from the square. With an outdoor garden and a tower of pretzels on the bar, this 800 year old building now houses a restaurant and brewery making the local Bozner Bier. Dumplings and schnitzels are the specialties on the menu but the little C&Gs decided they had finally arrived in Italy so their only options was to go with pasta. After they had the pretzels. In the morning we filled up at the delicious breakfast buffet, left our bags at the front desk, and made our way to the museum. Passing by the charming little shops I remembered I was in search of sunscreen, but figured it could wait till after the museum. I completely forgot we were now on Italian time, and all the shops close down for an hour or two to enjoy their leisurely lunch. Sunscreen had to wait till our next stop. The sunny (but shaded thanks to giant umbrellas) Piazza Walther was our destination for lunch. 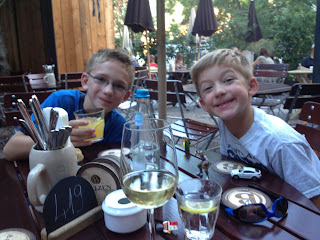 All of the restaurants looked equally good, so we picked one with an open table overlooking the square. They also had a gelato stand, which possibly could have swayed our choice. 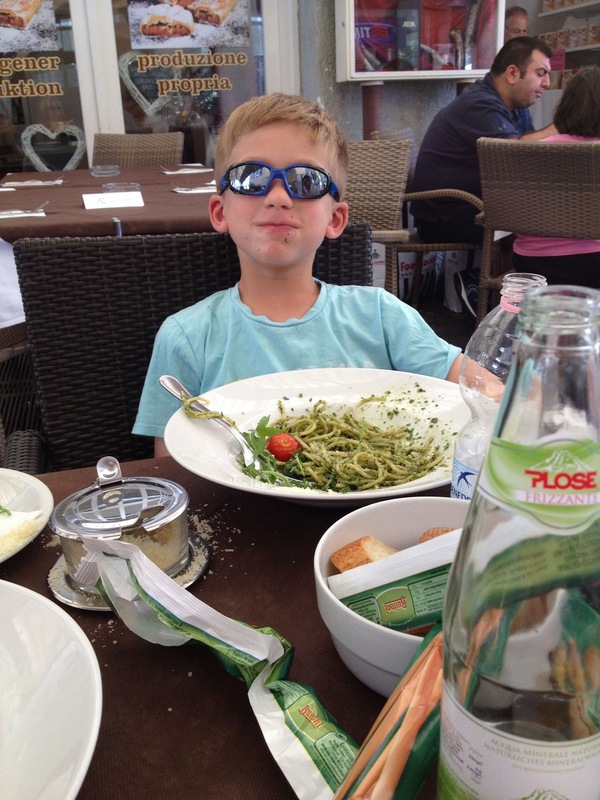 Little C&G has never looked happier, sitting outdoors, in Italy, with a big bowl of spaghetti alla pesto. Topped off with a big cup of straciatella and we were ready to hit the road to Venice. My usual Friday cocktail du jour post will be coming to you tomorrow, just in time for Mother's Day. Mr. C&G, the resident bartender, was out of town on business all week and I'm certainly not about to mix something up for myself. Who wants to drink alone? And most important, who wants to make their own drink? Certainly not Mrs. C&G!